Next week, we will release changes to improve the usability of our public and private statistics pages. The end result will be a more holistic view of the most critical aspects of investor’s holdings. Let’s take a look at what’s new. 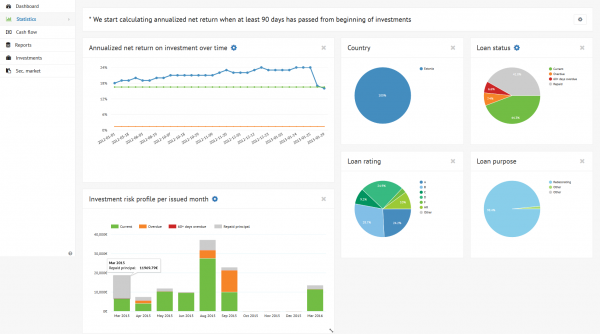 In both the Public Statistics page and the Private Statistics page you will notice that we have segmented the pie charts which reflect “loan purpose”, “loan status”, “loan rating”, “country”, and “bid size”. Previously this information was viewable only one at a time. That is, each pie chart could only be viewed in isolation from the others. Now, you can see all of this data in one concise view to get a more complete overall picture of your investments. We have also added a customizable feature to the “loan status” panel. Click on the top left gear icon to adjust the settings. You will be able to view the chart by balance rather than just by schedule. In doing so you can opt to view the total information by status (e.g. current, overdue, 60+ days overdue and repaid). We have added this same feature to the “investment quality per month” data. Users can isolate the portion of loans that are current or overdue. This enables a simpler reading of the loan performance over the long-term. The same feature is available in the Public Statistics page. Finally, you can use a new feature to prioritize the size and location of the pie charts in the private statistics page. Just click the tiny arrow in the bottom right corner of each pie chart panel to expand the data. Use the drag and drop feature to rearrange the order of the charts. We’ve also added a setting to add/remove the statistic widgets from or to the view. This can be done from the settings icon on the top right corner of the view. As always, we look to our users for feedback on changes to the platform. We welcome questions and suggestions on new and improved features to [email protected].